For months now, Microsoft has been working on a version of Microsoft Edge based on Chromium. It promises to make big improvements to Edge, which is not very popular, and after using it I can say it really does. This new update is fast and has a lot more features that you may be more familiar with if you use Chrome. 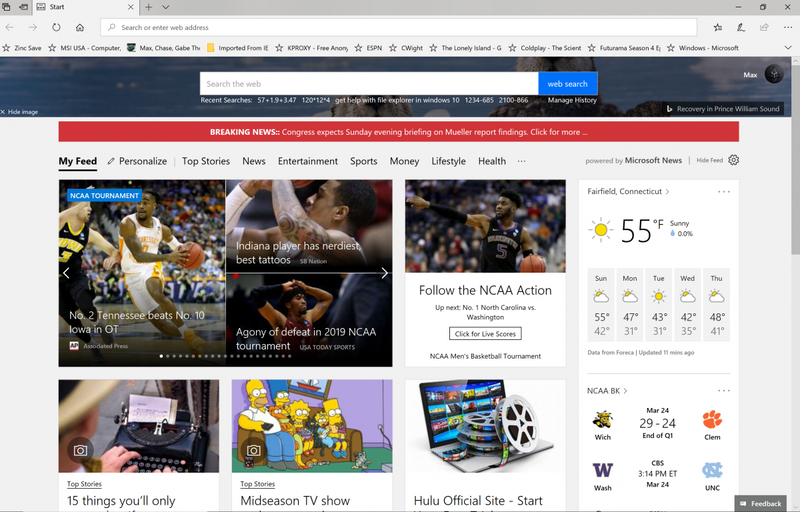 We were able to use the new version of Microsoft Edge through a leaked build for Windows Insiders. The design of the new Microsoft Edge is very similar to the old look. At first glance, it’s hard to know that it’s even new. The only noticeable difference is the lines around the address bar and the Microsoft account profile pic to the right of the address bar. The design itself isn’t the important part of this upgrade, that’s the Chromium base. Chromium itself is the base of the most popular browser, Google Chrome. It’s the open source version of Google Chrome that’s developed by Google for every platform including Chrome OS. It is one of the fastest and more stable browsers out there. Plus, it has many great features like a dark mode and extensions. As for actually using Chromium Edge, it is much faster. In my unscientific testing of loading the XDA Portal home page, it was about double the speed of the older Edge browser. I noticed this on almost every website I visited. As for HTML5 web tests, Microsoft Edge based on Chromium scores much lower. It was even lower than pre-Chromium Edge. Another advantage I noticed of Chromium Edge is extensions. The older version of Edge supported a limited amount of extensions through some developers who decided it was worthwhile to make extensions. 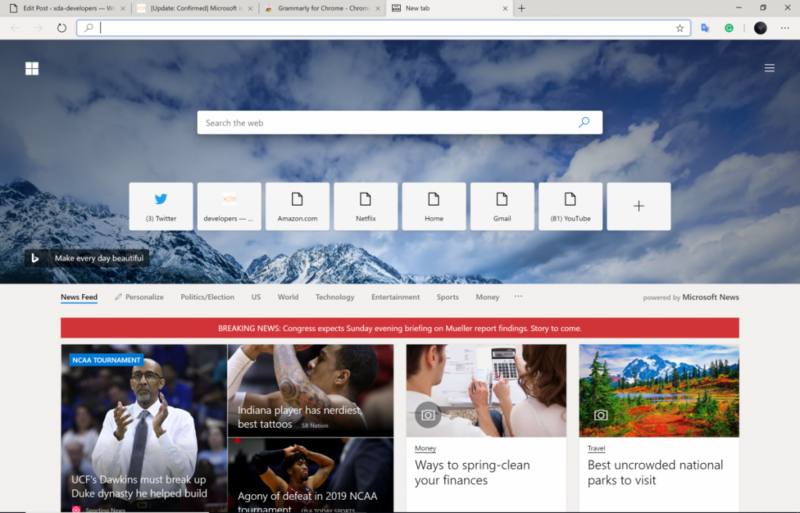 This new version of Microsoft Edge supports more than just Edge extensions, it supports all extensions from the Google Chrome Web Store after toggling a single switch. I was able to install both Grammarly and Google Translate, and both are working perfectly as if I was on Google Chrome. Another feature people will love is the dark mode included in Chromium Edge, but it isn’t enabled in this leaked version of Edge by default. It requires the feature to be enabled in the flags for Microsoft Edge. Once this flag is enabled, if you are using the Windows 10 dark mode, it will be enabled in the browser. The older version of Edge also has a dark mode but its good to see Microsoft is aiming to have this feature included in even the beta. All of these Chromium features on top of Microsoft’s own features makes it instantly one of the best browsers. It has an arguably better design than Chrome while integrating more deeply into Windows 10 itself. The original Microsoft Edge was not a bad browser, but it lacked certain things that Chrome users have come to rely on. This new version changes all of that. If any browser that isn’t Chrome is going to be included by Microsoft in Windows, its good to know that it’s this new Chromium-based Microsoft Edge. Next articleVegan influencer’s career in jeopardy after being caught on camera eating the wrong thing. Does The Andromeda Project Still Have A Future?